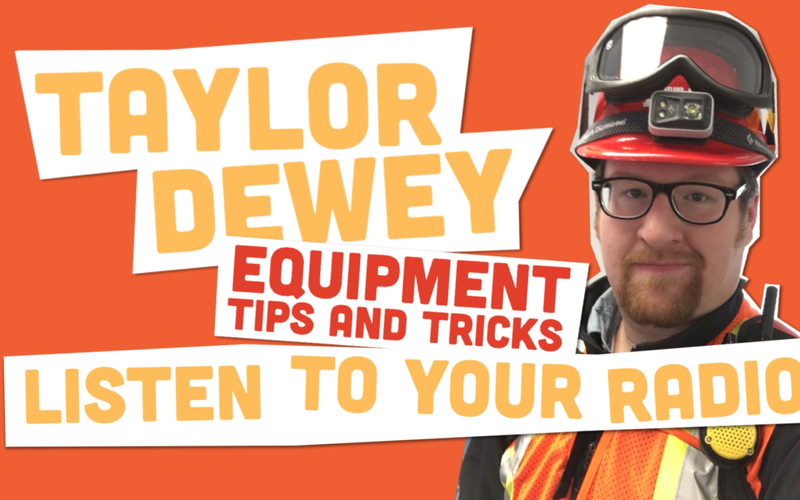 In this episode of Equipment Tips and Tricks, I share my preferred set-up to get audio from the radio into my ear. It allows me to operate the radio without interfering with whatever I’m working on and without compromising the ability to hear the environment around me. Hey there Portland NET and everyone else interested in community emergency response equipment tips and tricks. My name is Taylor. I’m a volunteer with the Kenton/Arbor Lodge Neighborhood Emergency Team in North Portland, Oregon. I’m talking about listening to your radio or, more specifically, how to get the audio from the radio into your ear where it’s most effective. Right, so I’ve got the two radios I deploy with:My ham radio, Baofeng portable (er, handheld) and my Motorola Talkabout FRS/GMRS. The one thing these two radios have in common is that their speakers… not so great. These speakers will work fine in a controlled environment, such as this studio, your house, inside of a car… But as soon as you get and you’re deploying to something—people are talking, sirens are happening, whatever else is going on in your environment—you’re quickly going to have this audio drowned out. Furthermore, you put the radio down on your hip or somewhere out of the way and the speaker’s pointed in the wrong direction. So, we need a method to get the speaker audio closer and ideally into our ear. Lots of different solutions for this. I’m going to describe the one that works best for me. And it starts with what’s called a speaker microphone, or speaker mic. And it looks like this. Really inexpensive on Amazon, we’ll pop some links for it over on http://portlandprepares.org if you’re interested in getting a direct link. But basically, this is an extension cord for the speaker and microphone on your radio. Plug it into your radio and you’ll hook this wherever you want. Now keep in mind that the plugs on here are proprietary to the radio. This is a 2-prong plug for Baofeng and Kenwood, but there’s lots of different varieties. And I can’t plug this into my Talkabout FRS radio — I need a different speaker mic. That’s the way things are. So we’ll put this into our radio and we’ll hook this wherever we want. These vests actually have a neat loop like this and you can put the radio there if you want. I prefer it here, right in front of my shirt. Some people hook it to their backpack straps. The problem with that is that if you take off your backpack to get into the gear: radio goes all over the place. Now this is an effective extension cord for the speaker and microphone, but it’s still not in our ear. Which means it can still get drowned out pretty readily. So, the bottom of this speaker microphone has a 3.5 millimeter jack or 1/8 inch jack for a listen-only headset. It basically says: use this for the microphone, take the speaker and put it somewhere else. Now for that, I prefer an earpiece something along the lines. This is what’s called an acoustic tube listen-only earpiece. This is the acoustic tube, this clear part. It doesn’t need to be clear—that just makes you look like a secret agent. And on the end of it, you can have any sort of ear attachment. So they make ones that go into your ear, they make foam earplug versions. This one is called an open-ear insert. It’s open because it allows audio from around you. All of the ambient noise of what’s going on to still get into your ear as well as injecting your radio audio. It’s also nice because it puts the speaker for this down here. Which means the whole earpiece part is very lightweight. This is super comfortable to wear all day. And you can route this other end of it however you want. Down into your collared shirt, whatever. So that’s the setup I prefer to use. As always, use what works best for you and test your equipment out. Get all your gear on, go walk around the neighborhood, go on an exercise with your team, whatever it takes to make sure your stuff is going to work in a real emergency. As always: keep Portland prepared at http://portlandprepares.org. If you want to add to this conversation or tell us what gear you like to use, head on over to YouTube we’ve got the comments there and, while there, you can also subscribe to the rest of these videos and get them as they come in. Thanks for watching, we’ll catch you next time!